For over 60 years, Charlie's Roofing has been serving the residential and commercial roofing marketplace with honesty, integrity and quality workmanship. We provide exemplary customer service and problem-free installations. We offer fair and competitive pricing. Charlie's Roofing only uses quality materials and workmanship which assures you peace of mind and a roof that will be trouble-free for years to come. We handle everything from your smallest repair to your largest roofing project. Whether you need a coupe of tiles replaced, or a complete roof inspection due to a leak, Charlie's Roofing can help. We are the most dedicated team that will satisfy all your roofing needs. What this means to you is FAST SERVICE! No matter what your roofing needs are, we will get the job done. Charlie's Roofing is a fully licensed, bonded and insured roofing contractor. We install and service a wide spectrum of Commercial Roofing Systems using the latest products and techniques for all types of commercial buildings. Whether it's new construction, re-roofing, periodic inspection and maintenance, or emergency services, Charlie's Roofing maintains an excellent reputation for providing prompt, reliable service. We specialize in both commercial and residential roofing, aluminum coatings, rubber roofing, gutters and much more. We cover New York better than anybody else - and all our work is guaranteed! Call us at 718-475-0240 for a free estimate. License Number HIC 0761797 - Fully Insured. 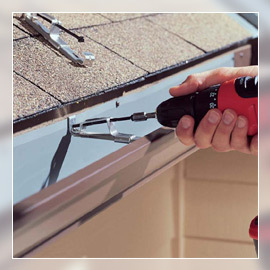 Charlie's Roofing offers a wide range of services including gutters, chimney caps and flashing.